Evo Syväjärvi destination will be upgraded in February, when a fixed hot tub is installed right next to the waterline. There will be really nice to enjoy the beautiful lake view and think about the purpose of life! The hot tub will be installed in the area between the lakeside sauna and the lake, and can be accessed directly from the current sauna path. Previously, the hot tub has also been available in Evo Syväjärvi, as a hot tub trailer has been delivered if needed. The idyllic destination of Evo Syväjärvi is very popular among fishermen and smaller business groups. 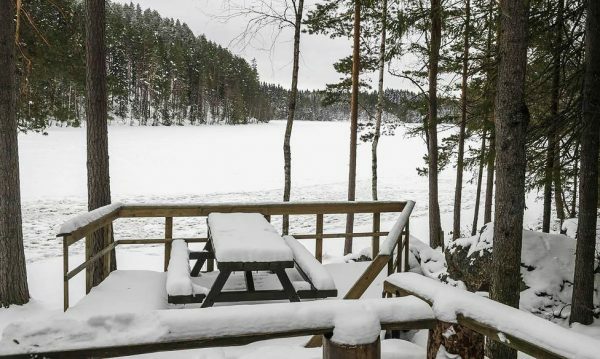 Naturally, the complex of three accommodation and sauna facilities on the shore of their own wilderness lake is also ideal for families and groups of friends to spend their holidays all year round. The hot tub will be available to guests of Syväjärvi as a separate additional service. In all of our locations, the tubs are rented either as a self-service facility, where guests take care of filling, heating and draining, or ready-made, pre-filled and heated. Read more about Evo Syväjärvi in its destination page.